If you've been following this blog, you'll know that I've decided to include etched ladder rungs in all new kit releases. I've been adding the etched ladder parts to custom built cars now, at clients request, and I'm here to reiterate that the etched rungs are a vast improvement over the idea of using commercial grabs. And of course I'm applying the etched parts to cars that I'm building for my own fleet. I'll admit that at the onset I resisted the idea of etched rungs. But having done a few cars now, I'm fully converted to the idea. It's been a hectic few weeks for me. Mostly been working out of the house with shows at the Budweiser Gardens. Last week we had 5 shows in 7 days. Those are long days without much sleep. Getting a little long in the tooth for that. But we're back in the shop working away again. 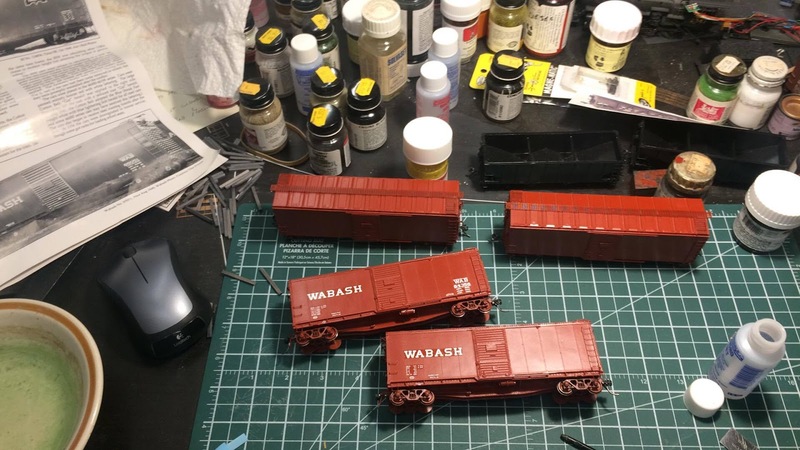 I've got 4 Sunshine Wabash rebuilds in various stages of decaling. We're going to be doing an episode on Train Master's TV on decaling. And to save studio time I'm prepping the cars to various levels of decal completion. We'll be looking at other things as well during that day of filming, but I don't want to spill all the beans. Check in TMTV often for lots of new and useful episodes. Yesterday I was handed another pattern for an upcoming kit. And I'm super excited. This ACL O-16-B has been in the works for awhile now. And I'm so pleased to finally have the body master in hand. The sides, and ends were all developed in Solidworks and then printed in high resolution 3D printer. The 2nd kit for us developed this way. The kit will include everything that you've come to expect from Yarmouth Model Works. Laser cut running boards, photo etched ladders, rungs and other detail parts, custom decals from Black Cat Publishing and Tahoe Model Works trucks. This kit should be available for sale in a few months. Watch the blog and the website for release annoucements. There's been an excellent description as to how to use Yarmouth Model Works ladders etchings.